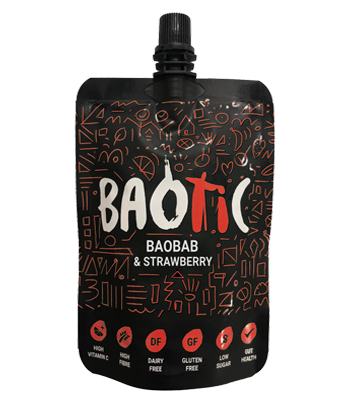 "Multivitamin And Prebiotic Drink For Guthealth"
Hi, I’m Baotic Original, the native Baobab version in its purest sense. That’s me. I showcase the true taste-bud tingling zest of the super Baobab fruit (my hero! ), and I pack quite a zing! I’m high in multivitamins and fibre, beneficial for regular daily intake, and help you stay fuller for longer so a small, easy, convenient pouch packing an enormous impact. Enjoy! 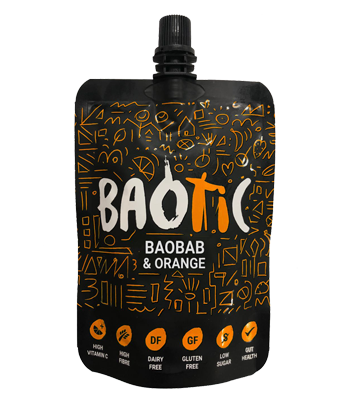 Hi, I’m Baotic Baobab & Orange the refreshing citrussy drink with a zingy baobab kick! I’m high in Vitamin C, with more natural multivitamins. My high fibre will help keep you fuller for longer compared to your normal breakfast juice. Chuck me in your bag, and have me as you please! I’m a small, convenient pouch packing an enormous punch. Enjoy! Hi, I’m Baobab & Banana, the high energy Baotic, with my super sherbety kick! I’m a super smooth blend, improving the normal banana consistency with an additional health boost through my superhero superfruit. I come in individual pouches and help you choose the quantity that you prefer. I’m super convenient multivitamin for the super active or super sporty and can be taken with you to be supped on the go! Enjoy! Hi, I’m Baobab & Strawberry the Berry Baotic. I’m also low in sugar with sweet summery strawberry notes and my sharp sherbety kick! I’m a super convenient, fruity, smooth blend with multivitamins on the go! I add something a little extra to your ordinary very berry drinks. Enjoy! Pure, raw and organic certified Baobab Super-fruit Powder. One of the highest nutritional profiles on the market, in Biodegradable environmentally friendly packaging. No added Sugar. From ethically sourced co-operatives of female wild-harvesters, supporting income generation and community development initiatives. We are a multi-award winning business start-up based in Scotland. Hippo & Hedgehog Ltd represents our multicultural background and was established to tailor African ingredients to the UK taste bud. Our story began in 2008 when Paul went to live with Isatou and her family in rural Gambia with Voluntary Service Overseas (VSO). Isatou and her family produced and sold Baobab drinks for the local market, and we have dreamt to bring them to the UK/EU stores. And here we are!